Proverbs 15:1 tells us that a "soft" answer can turn wrath away. Staying calm, cool and collected is a learned skill. It does not come naturally but super-naturally. Some time ago I bought my first Crock-Pot. 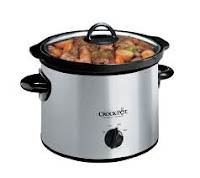 I was looking for something that would cook for me and do it without very much attention and the Crock-Pot fit the bill. They even make dinners pre-assembled now that you just have to mix up in the morning and then in 8-10 hours your meal is waiting for you! Now the interesting thing about this item is that it can be on all day and not burn up what is inside. The temperature that it cooks with is perfect! It made me think about this scripture in Proverbs and I realized that many times I am a microwave of angst and emotion when God would rather I be more like my Crock-Pot. If I could just allow myself to remain at an even temperature there would be no sudden outbursts or explosions that leave messes. At the end of the day I could enjoy the grace of God that has been cooking within me all day! Is your temper like a microwave or a Crock-Pot? Try being quick to listen but slow to speak...simmer down and then stir up your thoughts in your head allowing yourself to remain at just the right temperature. At the end of the day, you too will enjoy what God's been cooking in you!